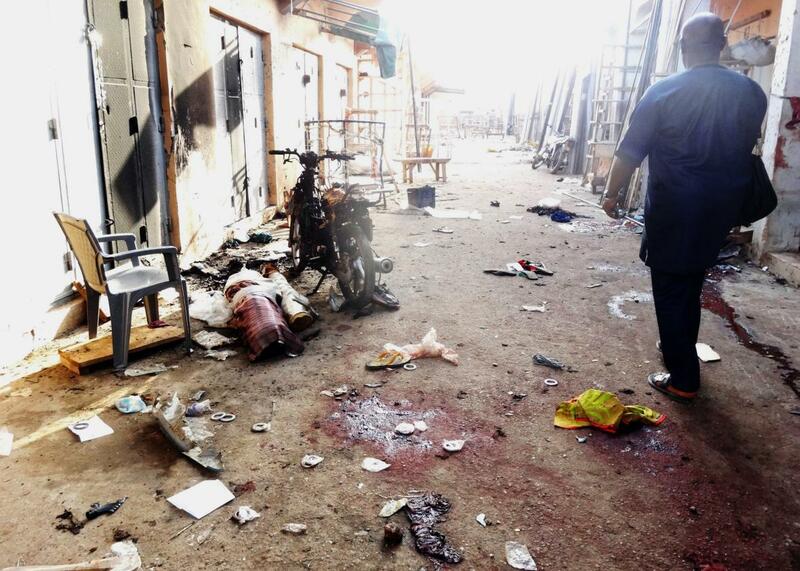 A man walks past blood stains and rubble after twin suicide blasts at Kantin Kwari textile market in northern Nigeria’s commercial city of Kano on December 10, 2014. The Institute for Economics and Peace picked quite a week to release its annual Global Terrorism Index. The report, which came out on Wednesday, tracks incidents in 2014, so it doesn’t account for last week’s Paris attacks or other major incidents this year like the Charlie Hebdo massacre and the Metrojet bombing. Despite looking slightly dated because of the dramatic global events of the last month, the index does reveal some important trends in global terrorism, many of which run contrary to how the problem is normally discussed in American political discourse. The big headline is that terrorism is becoming much deadlier—deaths linked to terrorism increased by 80 percent to 32,658 in 2014, the largest increase ever recorded. Nigeria’s Boko Haram overtook ISIS last year to become the world’s deadliest terrorist group, killing 6,644 people. The group’s threat has hardly diminished this year as two deadly bombings this week show. Together, the two groups were responsible for more than half of all fatalities and both aimed their violence at private citizens rather than government or military targets to a much greater extent than other groups. While President Obama reminded Americans this week that al-Qaida and its affiliates are still a threat to western countries despite all the attention on ISIS, the GTI shows that the terror network wasn’t even one of the five deadliest groups last year: Those were, in order, Boko Haram, ISIS, the Taliban, Nigeria’s Fulani militants, and Somalia’s al-Shabaab. Terrorism also remains a highly localized problem, with just five countries—Afghanistan, Iraq, Nigeria, Pakistan, and Syria—accounting for 78 percent of terrorism deaths and 57 percent of all attacks, but it’s getting less localized. The number of countries suffering over 500 terrorism deaths increased from five to 11 last year. The countries with at least one death increased by eight to 67. Still, jihadist attacks in the U.S., the form of terrorism that gets by far the most global media attention, have continued to be relatively rare. Attacks in western countries have accounted for just 2.6 percent of terrorism deaths over the past 15 years–82 percent of those were on 9/11. In 2014, they were just 0.11 percent. Over the past 10 years, attacks motivated by Islamic extremism accounted for only 19 percent of terrorism fatalities, while political extremist attacks, such as Anders Breivik’s killing of 77 people in Norway in 2011, were the deadliest. Most (70 percent) attacks in the west are the work of “lone wolves” rather than organized networks. The United States was the deadliest western country for terrorism in 2014, with 18 fatalities in 19 attacks. Four of these incidents had a “jihadist element,” according to the report. The rest were “largely motivated by right wing extremism or white supremacists.” The worst incident was the killing of two police officers and one bystander by anti-government extremists at a Las Vegas pizza restaurant on June 8. The two attacks in Paris alone will make 2015’s numbers for western countries look very different. The question is whether they will come to be seen anomalous catastrophic attacks, like the 2004 Madrid train bombing or the 2009 Fort Hood massacre, or the start of a more permanent trend. The report notes that 21 plots linked to ISIS in the west in 2014 all happened after September when the group issued a call for attacks on western countries. ISIS inflicted far more casualties on the battlefield in Syria and Iraq than by terrorist attacks in 2014, but the events of the past month could signify that the group’s emphasis is shifting. It remains to be seen whether violence perpetrated by ISIS or other jihadist groups becomes less rare in western countries, but it’s a safe to assume that people in the countries where these groups are based will continue to be their main targets.